This Skulltastic Camo spring assisted knife is one of the fastest spring assited knives on the market. The razor-sharp 3 1/2” blade opens with vicious speed with just a nudge of the blade flipper. The blade is coated with a baked-on black finish for glare reduction and corrosion resistance. 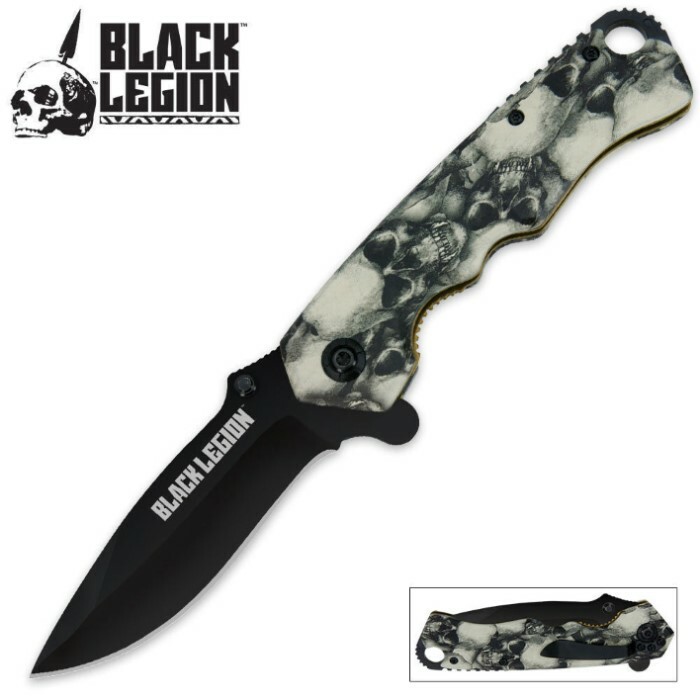 A 4 3/4” aluminum handle is finished in a “skulltastic” camo pattern that is so wicked it scares off most attackers without even opening the blade! This isn’t some tiny little pocket knife, this spring assisted knife offers full-size cutting power in a folding knife package that measures 8 1/4” in overall length. Whatever chore you are facing, this awesome knife can surely get the job done! very solid and well made, comes razor sharp and feels like it was made for my hand and work. I use it at work to perform electrical repairs. I need a knife that I can open and close with only the use of one hand for a lot of times I am in tight spots. this knife is all around perfect. The knife is really sturdy and can be nicely sharpened. For the price it is absolutely fantastic! Sturdy construction and a cool design. Sharp blade out of the box. The knife is heavier than it looks but feels good in your hand. 5/5 I got more than I paid for with this one. Great knife! Great company and great costumer service!! Not much more to say. Eveyone i've showed this to loves it. Purchased these as gifts and I'm so happy I did. These are super cool and great quality. Feels more like a $50 knife and I'm proud to give them as gifts. This is a very solid heavy weight knife. The auto assist opening makes it very easy to open. The pocket clip sits high enough to not leave to much of the knife exposed and enough to make it easy to deploy. The Skull pattern looks very good and has been scratch resistant so far. I bought 2 when they were on the $5 sale and I had I known how nice these were I'd of bought more to give as gifts or as back-ups. These are worth the money even at the $9.99 price shown right now. Nice weight, sharp and solid. Brass liner is a nice touch. Heavy enough to be effective as a glass breaker. Finger grips in scales are perfect. I removed (unscrewed) the thumb stud to make it easier to pull out of pocket, they aren't needed anyway with the blade flipper (spur). Very good blade. Snaps open with good force, handle is nicely printed. Much better than I expected for the price.